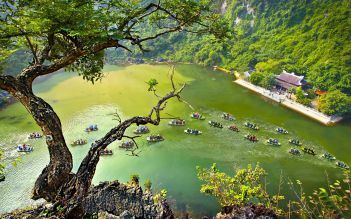 This 3-day tour start from Hanoi with English speaking guide to discover Ba Be National Park, Ba Be is the largest natural freshwater lake in Vietnam with exceptional biodiversity including a population of langurs, over 200 bird and 350 butterfly species, geological treasures and mature primary limestone forests. Join our tour, you will have memorable time when exploring the lakes, caves, mountains and jungles. 7.30 - 8:00 pick up from your hotel in Hanoi for driving on highway No3. 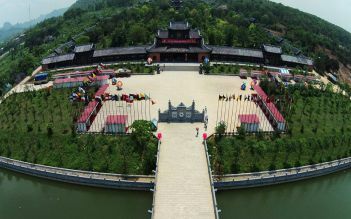 You will also visit the Museum of the Cultures of Vietnam’s Ethnic Groups in Thai Nguyen City where you can browse the objects, photographs and exhibits that give a better understanding of the various ethnic groups and their agricultural tools, handicrafts and traditional costumes worn for worship. 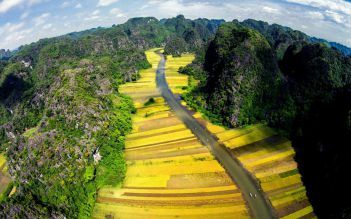 There will be a stop for lunch before your transfer extremely north to Cao Bang through scatterings of villages and rice paddies. You will get the chance to stop at a village known for its tobacco production (depend on growing season). 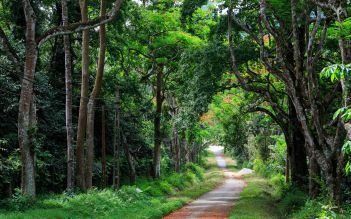 This is the road less-travelled offering you the enjoy the views in peace. Tonight, you have dinner and stay overnight in the homestay of a Nung's family in Quang Uyen. After breakfast at the homestay, you will depart for Trung Khanh which lies on the border with China. Here you will have the chance to meet the Nung people in the village of Phuoc Sen, a mountainous village famous for its traditional blacksmith craft. The farming tools made here are an integral part of the lifestyle which is evident in the surrounding rice paddies and fields. Nestled in amongst these amazing landscapes is the breathtaking Ban Gioc Waterfall which spans over 300 meters, half in Vietnam and half in China. You will have time to soak up the powerful atmosphere of the falls and take some fantastic photos before heading to another natural wonder, Nguom Ngao Cave. This cave stretches out 2,144 meters underground and is brimming with incredible stalactites and stalagmites. You will then make your way to return Cao Bang town and going down on snake pass to Ba Be Lake, tonight you will stay overnight on traditional house of Tay ethnic family. At the homestay, you can relax and unwind from the day and enjoy a meal of home cooked local food. You can relax on board, do some wildlife spotting or if you need to cool off, you can jump into the cool, clean waters for a refreshing swim! As you float on Ba Be Lake, you can take in the scenery of the surrounding karsts decorated with patches of wild vegetation and inhabited by all sorts of interesting creatures. The boat ride along the Nang River, with time to explore the stunning Ba Be Lake, the caves of Puong Grotto where you can explore the stalactites and stalagmites which are a result of the erosion of the river on the karst as well as looking out for the bat colony several thousand strong. 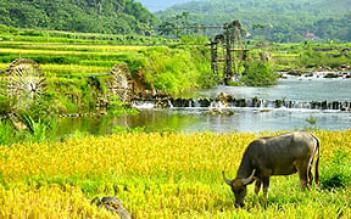 You will depart for the journey back Hanoi, a drive of approximately 150 miles (230 kilometers). We will stop at some hills tea plant before returning to your hotel in the bustling city of Hanoi. Pack essentials, including light comfortable clothes suitable for outdoor activities, comfortable walking shoes. Take a small day pack for hiking and trekking. It is essential to bring your passport on this trip. We also recommend packing: insect repellent, sun cream, raincoat and sun hat..
Ba Be Lake is a beautiful, peaceful place. The cruise is a real treat for the eyes. Nothing like dreaming over the water and indulge in meditation. On arrival, a beautiful walk leads us through a wood to refreshing waterfalls. We came across many multicolored butterflies and even a beautiful snake! At lunchtime we had dinner in a typical, picturesque waterside restaurant accompanied. Good-natured atmosphere and nice cooking with a little preparation course to pass. Back to earth. A very good moment! The setting of the lake is splendid in the middle of limestone karst peaks but what is even better is the boat ride to go to the cave of Dong Puong which is fabulous among the limestone cliffs adorned with stalactites to such a point that one can get take for Martin Sheen in Apocalypse Now. The cave of Dong Puong is the passage under the mountain of the river which has roughly the flow of the Garonne in Toulouse. It's great. Downstream (to the west) the Dau Dang Falls are also worth the detour. Attention to pollution. Too much plastic waste floats on the lake and it's a shame in such a beautiful site. Overnighted here on our bike trip and it was a (cold) and nice experience immersed in the nature. Nice boat trip around the lake, despite the rainy weather, shame that we could not stay longer. The homestay was appreciable with very good food. Beautiful boat trip on Lake Ba Be. It is best to leave early in the morning to enjoy the light that plays with the water and the mountain (and to avoid all the tours operator). Visit a cave and a waterfall and a stop at lunch in a local restaurant.